Age 80, died April 15, 1999 at his residence in Ft. Lauderdale, Florida. He was born in Penns Grove, New Jersey on November 11, 1918. He grew up in the Atlantic City area where he graduated with honors from the Atlantic City Institute of Trades. He played semi-professional football and ice hockey prior to enlisting in the U.S. Army in 1939. After being selected for flight training, he was commissioned a Second Lieutenant and completed 89 missions in Europe supporting the Invasion and General Patton's operations. During this time he was credited with three confirmed aerial victories and two probable while receiving the DFC and 10 Air Medals before returning to Atlantic City where he began a successful Service Station and Automobile repair business. While serving in the NJ Air National Guard, he returned to active duty during the Korean War. During the next 22 years, he again, participated in the Vietnam conflict serving three tours as a Squadron Commander of the 416th Tactical Fighter Sq. receiving another DFC and an additional 20 Air Medals. Lieutenant Colonel Purcell retired from active duty as Director of Combat Operations at Shaw AFB, SC in 1972. He and his wife, Virginia (Ginny) Dutton Purcell then moved to Fort Lauderdale, Florida and made their home there until his death. His wife Ginny predeceased him in April of 1997. 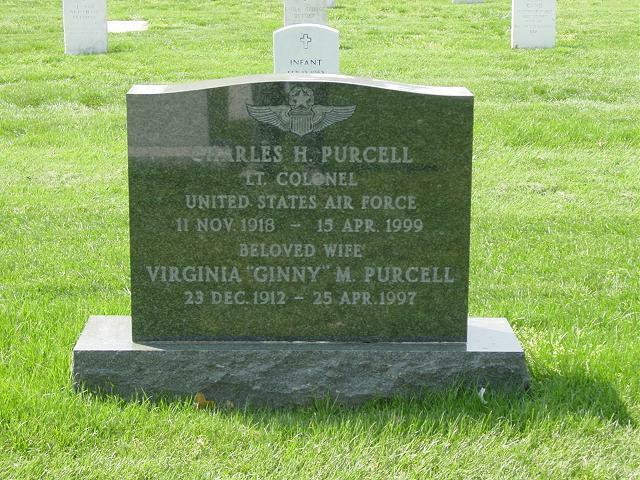 He is survived by his son, Charles W. Purcell, two grandchildren, Charles R. and Page Purcell of Fairfax, VA. He is also survived by four brothers, William, Robert, Milton all of Atlantic City, and Buddy of NC; and a sister, Charlotte Garrelli also of Atlantic City. Mass of Christian Burial will be celebrated on Monday, May 10, at 9:45 a.m. at the Fort Myer Old Post Chapel. Interment to follow with full military honors at Arlington National Cemetery next to his wife.